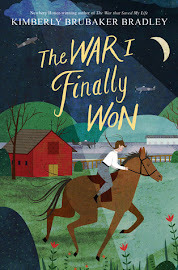 One week from today, the newest Caldecott winner will be announced. (No, I have NOT been counting down the days, but yes, I am looking forward to it.) And so, I thought it would be appropriate today for the boys and me to put in our two cents about who we think the winner will/should/ought to be. Aaron and Maxwell don't understand the significance of the Caldecott Award, of course. They hardly even notice the shiny stickers attached to past winners. That being said, some of our very favorite books have received the award (The Lion and the Mouse, Kitten's First Full Moon, Joseph Had a Little Overcoat, to name a few), so it's worth paying attention to. DISCLAIMER: I should preface these three books by saying that we're not basing any of them on any official Caldecott criteria. We just each picked our favorite from the potential candidates. Zebra is putting on an alphabet show. Moose can't wait for his turn, so he keeps popping up prematurely. And then, the letter "M" comes and goes without any mention of Moose. It's almost too much to bear. Luckily, Zebra thinks of a way to save his friend's pride. Maxwell's not so detailed but extremely enthusiastic thoughts: "It's FUNNY! I love it 'cause it's funny. I love it 'cause the zebra says Moose doesn't start with 'Z.'" Zelinsky's artwork is delightful. Aside from the text, it is completely witty in and of itself. Zelinsky won the Caldecott Medal in 1998 for Rapunzel, so who's to say he couldn't do it again? Actually, Maxwell mentioning that this book is funny may be the best possible description you could give it. The first time we read it, the boys were practically rolling on the floor. I couldn't keep a straight face either. In a world of hundreds of dry and boring alphabet books, this one shines through as a keeper. 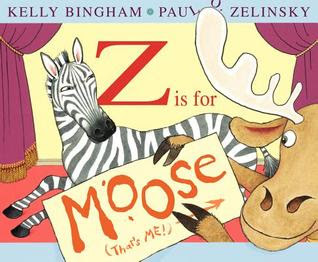 It still goes through the alphabet letter by letter, but interwoven between all the letters is the story of Moose's antics, Zebra's frustrations, and ultimately, their unwavering friendship. A delightful story + the alphabet = what more could you want? When it comes to math and science, Randy Riley is a whiz. But when it comes to baseball, Randy Riley is a flop. He loves to play but just can't seem to hit the ball. One night, Randy is looking through his telescope, and he sees a fireball headed straight for earth! By calculating trajectories and speed and potential mass, Randy devises a plan for how to smack that fireball right out of this world. Aaron's not so detailed but extremely enthusiastic thoughts: "I like that he made that really big robot and the robot hit the fireball. [Ooops, spoiler!] That's my favorite thing. And it was cool that it had cool pictures. And it was exciting. If you know anything about my family, it is that we are all in love with Chris Van Dusen's books. Honestly, The Circus Ship might well be our favorite picture book of all time. I'm kind of indignant that he has never won even a Caldecott Honor, so I obviously don't understand what the committee is looking for. His illustrations delight and captivate us like no one else: they are original, funny, full of quirky details, and always seem to be bathed in sunlight. Also, I should mention that this book has a great moral, which is that everyone is blessed with different interests and talents. Sometimes what we are interested in is not what we have a talent for (Example: as a child, I loved figure skating and read books and watched documentaries and competitions, but I had absolutely zero ability when I put on a pair of skates myself). But this story shows that you can use your talents in amazing ways to do amazing things, and those amazing things might just involve the other things you're interested in. The book follows Baby Bear and his mother through the sights, sounds, and smells of a single day. My not so detailed but extremely enthusiastic thoughts: I love this book. When I look at the pictures, I am lost in stillness and beauty. I feel like I'm lying in a meadow on a warm day in late spring (which sounds like HEAVEN right about now). It's a sweet and simple story full of color and everyday magic. 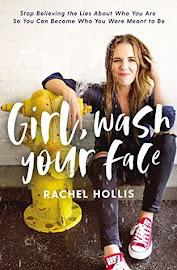 I've already reviewed this book once because, um, I looove it. So if you want to read even more of my thoughts and gushings, go here. Besides these three, we have loved a whole host of other books that were published in 2012, so I doubt we'll be disappointed with the winners. You can be sure I'll be sharing my thoughts next Monday. 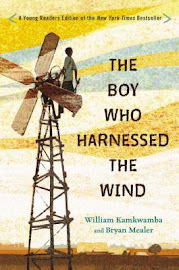 I shared this post at The Children's Bookshelf and the Kid Lit Blog Hop. That bear book looks so cute! I think Baby Bear Sees Blue has a good chance of winning but honestly, I didn't find it as fascinating as everyone else did. It's lovely, yes and is deserving -- only a matter of preference for me. Thanks for sharing at TCB again, I'm excited to see who will be selected as this years winner! I agree that the premise of Baby Bear Sees Blue isn't overly original, and usually I don't really go for the cutesy, warm-and-fuzzy books because they don't have a strong draw for my boys, but I truly adore the illustrations in this one. They get me every time. These are all great choices. 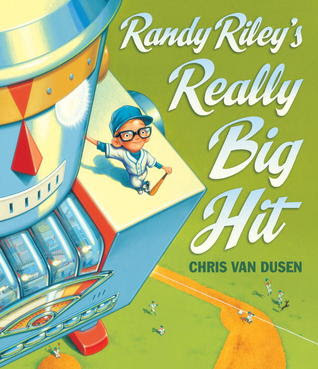 I loved the illustrations in Randy Riley's Really Big Hit (and anything baseball-related is a must in my house). I can't wait to see this year's Caldecott picks! I'm glad you liked Randy Riley, too. It seems like not very many people have heard of it. I like your picks -- Z is for Moose is an awful lot of fun, and I've heard some buzz about Baby Bear Sees Blue, so who knows? Guess we'll find out on Monday! There are some other great contenders as well. This has been a good year for picture books. I need to read Z is for Moose again - for some reason it didn't do a lot for me the first time around, but everyone seems to LOVE it. And I haven't even heard of Randy Riley's Really Big Hit. Shame on me. 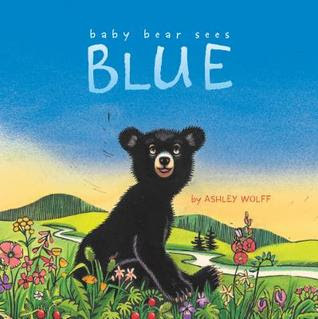 I have Baby Bear Sees Blue on reserve from the library and I can't wait until I get a chance to read it. We also love The Circus Ship! Baby Bear Sees Blue is a great one. I won't be at all surprised to see it medal this year. Are you surprised by the winner? I had not read This is Not My Hat but I recently saw it in the bookstore when I was there. I can see why the buzz was good about the book - it certainly is visually different. I agree with you though, Z is For Moose is a cute book. Thanks for linking into the Kid Lit Blog Hop! I'm a little hopping around... sorry! Yes, certainly surprised by the winner, and more than a little disappointed.